Ford is laying the groundwork for its autonomous vehicle business in Miami, Fla. It’s a three-pronged approach that is still in its infancy, but includes a delivery pilot in partnership with Dominos and Postmates, testing self-driving cars around the city and setting up a fleet-management center. Many other companies in the self-driving space have begun testing both delivery and ride-hail services, but few have established dedicated fleet-management centers that will facilitate the maintenance and operation of these driverless vehicles. Determining how best to manage a fleet of driverless vehicles will figure largely in any company’s ability to launch and expand its service. Without drivers, the company has to determine who or what will take on both the responsibility and the costs of maintaining these vehicles. There’s no longer an Uber driver in the front seat to take the car to get detailed on their own dime. Sherif Marakby, Ford’s VP of autonomous vehicles and electrification, said the company has yet to decide whether it will operate this network of fleet-management centers on its own or partner with another company. Other companies have opted to work with car-rental companies with an existing network of locations. Alphabet’s self-driving arm, Waymo, for instance partnered with Avis — a deal that gives Waymo access to places to store their cars when they’re not in use, as well as a nationwide web of maintenance and repair shops. Apple, long rumored to be working on self-driving cars, struck a deal with Hertz. General Motors, on the other hand, operates its own car-sharing service called Maven that could serve the same purpose for its self-driving arm, Cruise. This self-driving terminal, as Marakby referred to it, helps build a foundation upon which Ford can launch both its driverless ride-hail and delivery services by 2021. Marakby contends that this announcement indicates that Ford has launched its business in the city. However, the other two prongs of its launch are largely foundational. Like most other companies in the self-driving space, Ford will begin testing its self-driving cars on public roads. 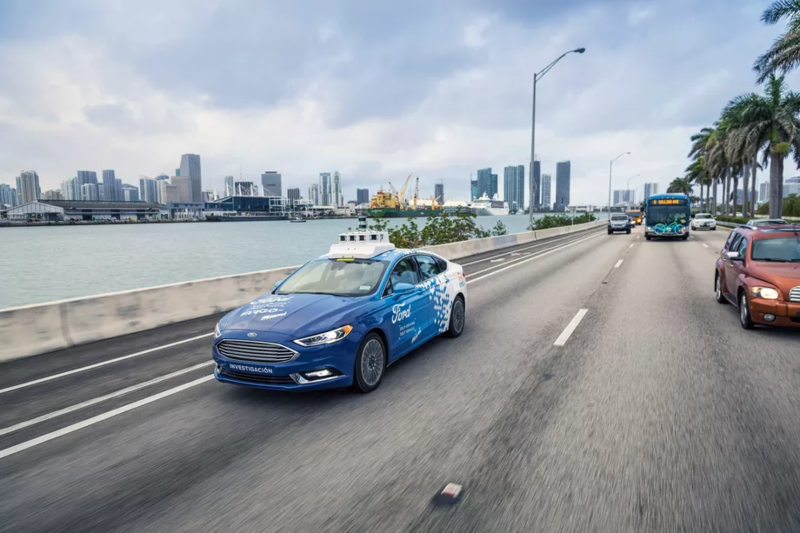 In Miami, however, the cars — powered by self-driving startup Argo.AI, in which Ford bought a majority stake — are still mostly mapping out the city’s streets for now. The company said they are also operating in a closed loop in autonomous mode. Those cars will eventually be available in a commercial ride-hail network. The company recently partnered with Lyft and is currently working on creating the interface for the system and the API into the company’s network, Marakby said. There’s no word just yet on when consumers will be able to hail a Ford vehicle on the Lyft app. At the same time, Ford is beginning a test of its delivery partnerships with Dominos and Postmates, but it won’t be autonomous at first. Instead, the company is simply trying to learn more about the customer interactions with a delivery vehicle. The company is attempting to understand things like how far customers are willing to walk to a car to get their delivery. In the pilot phase, there will be two separate fleets dedicated to either delivery or ride-hail, but Marakby said that could change once the company launches the businesses, depending on the volume of deliveries or goods that need to be delivered. If a vehicle that Ford is building from the ground up to be autonomous has a high rate of utilization by a delivery partner, then it will likely only serve in that delivery partner’s fleet. If not, those vehicles could serve multiple purposes.